Following the rather shocking news that Michael Moore would debuting his previously unannounced new film WHERE TO INVADE NEXT at this year’s Toronto International Film Festival, Thom Powers and the TIFF gang have revealed the entire TIFF Docs program which no consists of a staggering 31 films. 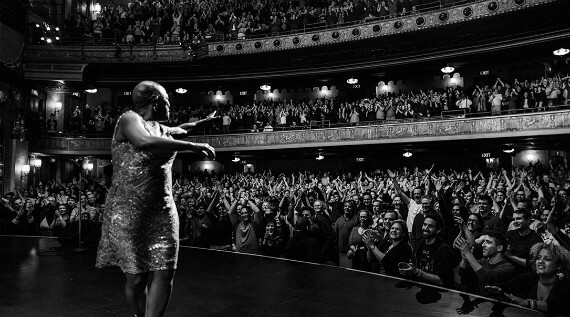 The slate includes a wealth of music based docs such as Barbara Kopple’s MISS SHARON JONES!, Morgan Neville’s THE MUSIC OF STRANGERS: YO-YO MA AND THE SILK ROAD ENSEMBLE, Kahlil Joseph’s THE REFLEKTOR TAPES, which was previewed by Hugh McIntyre at Forbes, and a new film shot by Sydney Pollack titled AMAZING GRACE on Aretha Franklin’s record of the same name. The film received a pair of previews thanks to Steven Zeitchik at the LA Times and Flavorwire’s Jason Bailey. Also included in the lineup is IN JACKSON HEIGHTS, by Fredrick Wiseman, who was interviewed this week about the film by David Ehrlich at Little White Lies. Thom Powers himself spoke about the docs at TIFF this year with Realscreen’s Kevin Ritchie, as well as with David Poland on his Youtube interview series DP/30. Writing for indieWIRE, Laura Berger also surveyed the non-fiction offerings at the fest, as did Tom Roston at Doc Soup, Gregg Kilday at The Hollywood Reporter, Michael Cieply for The New York Times and Matt Goldberg at Collider. While TIFF Docs harbors the majority of non-fiction films at the festival, two new programs offer a few surprises including Alan Zweig‘s HURT: THE STEVE FONYO STORY, which screens as part of the new Platform competition reports Realscreen’s Daniele Alcinii, and Morgan Neville’s KEITH RICHARD: UNDER THE INFLUENCE, which will play in the new television sidebar, Primetime, reports Jeremy Egner in The New York Times. Ambulante California, an nontraditional roving film festival that calls to mind the travelling festival project put together by actress Tilda Swinton and filmmaker Mark Cousins back in 2009, has also announced their documentary stuffed lineup according to Kate Erbland at indieWIRE. Carolina A. Miranda of the LA times attempted to explain why Diego Luna and Gael Garcia Bernal, the festival organizers, have decided to stay away from utilizing traditional movie theaters for their Ambulante screenings. Also on the topic of festival lineups, Basil Tsiokos previewed the doc offerings at this year’s Sarajevo Film Festival at What (not) To Doc. While announcements were flowing out of Toronto and Ambulante, the Locarno Film Festival has been in full swing. As reported by Giorgia Del Don at Cineuropa, the festival’s first ever Doc Alliance Selection Award went to Abbas Fahdel for HOMELAND (IRAQ YEAR ZERO), which was nominated by Visions du réel Festival in Nyon. Additionally, Giorgia wrote a piece on Chantal Akerman’s competition entry NO HOME MOVIE, as did Daniel Kasman at Notebook and Peter Debruge for Variety. Jimmy Chin and Elizabeth Chai Vasarhelyi’s Sundance debuted MERU was the most written about non-fiction feature this past weekend and was selected as WNYC’s Doc of the Week. Susan King of the LA Times and Paula Mejia of Newsweek both wrote substantial features on the film, while Joshua Brunsting of Criterion Cast and Brian Tallerico of RogerEbert.com gave it a pair of positive reviews. For Nonfics, Dan Schindel not only reviewed MERU, but interviewed Elizabeth Chai Vasarhelyi about the dangers of composing such a film. At The New York Times, Cara Buckley questioned why MERU, along with many other films, are being released now and not another time in the ever more cramped theatrical release schedule. Complimenting the release of MERU, Op-Docs premiered a new short by Vasarhelyi titled CLIMBING THE SHARK’S FIN, while Heather McIntosh wrote an update at the Documentary Site blog on her experiences using Op-Docs as a teaching tool. Another film that was released theatrically this week was Gina Leibrecht’s friendship portrait of Richard Leacock and Les Blank, HOW TO SMELL A ROSE. The film was lovingly reflected on by Michael Fox at Keyframe, as well as by Nicholas Rapold in The New York Times and Daniel Walber at Nonfics. Hubert Sauper’s WE COME AS FRIENDS was also released and covered by Ben Kenigsberg in The New York Times and Joshua Brunsting at Criterion Cast, while Nonfics’ Jamie Maleszka spoke with the filmmaker himself. Other reviews from around the net included pieces on Aviva Kempner’s ROSENWALD by Daniel M. Gold in The New York Times, Stevan Riley’s LISTEN TO ME MARLON by Jen Chaney in The Washington Post, Crystal Moselle’s THE WOLFPACK by Stuart Jeffries in The Guardian, Bobcat Goldthwait’s CALL ME LUCKY by Shari Springer Berman and Robert Pulcini at The Talkhouse and Tiller Russell’s PRECINCT SEVEN FIVE by Bekzhan Sarsenbay at Little White Lies. For doc filmmakers looking for tips, indieWIRE has published their latest Ultimate Guide to Documentary Filmmaking, featuring a lengthy list of articles from filmmakers on a wide variety of topics relating to doc production. Additionally, indiewire published a piece by filmmaker Marshall Curry on his definition of fair and balanced means for his films. Filmmakers Lyric R Cabral and David Felix Sutcliffe continue their campaign to raise funds to cover their expenses racked up while producing their incredible new film (T)ERROR. After launching a Kickstarter, this week the filmmakers took to the Sundance Institute blog in an effort to raise awareness about their plight. Lastly, I leave you with the VICE spoofing first episode of IFC’s DOCUMENTARY NOW! series, featuring Jack Black, Bill Hader & Fred Armisen, as well as a surprise new film by director Mark Cousins titled ATOMIC, LIVING IN DREAD AND PROMISE, which was scored by Mogwai and his currently being hosted by BBC’s Storyville for free. Until next week, if you have any tips or recommendations for the Memo in the meantime, please contact me via email here, or on Twitter, @Rectangular_Eye. I look forward to hearing from you!